Step 1, grab a spoon. Step 2, grab a gallon of ice cream and find a comfy spot ... just kidding. Although I admit this briefly sounded like a good idea. But since I'm trying not to stress eat, well we all know this isn't the solution. As most of you know, I've found myself on the injured list again. (Why You Need To Listen To Your Body). And with each injury, I learn something new. This time, it's my hip, but it stems from underlying problems. My back and pelvis are out of whack which is usually the result of poor form along with weak muscles. And honestly, I'm tired of finding myself here. If I know that my muscles are weak, then I should work to make sure they get strong. So with this injury, I'm determined to make some changes. I should state that I am not a medical professional. I do not have a medical background. I am not a doctor nor do I play one on tv. Now that we have that out of the way :) Here is what I have learned (and am learning) through personal experience. If you find yourself injured, take some time to try to figure out the why. Did you fall? Was it just an accident? Is it overuse? Do you try to do too much too soon? Did you feel something nagging but you ignored it an kept running? What is your reason for your injury? I think that's probably the first step in getting through an injury and not letting it return. For me, it was a combination. I felt things were off in my hip, but I pushed through. I felt pain, and I pushed through. I increased my mileage. I should have rested when I kept going. 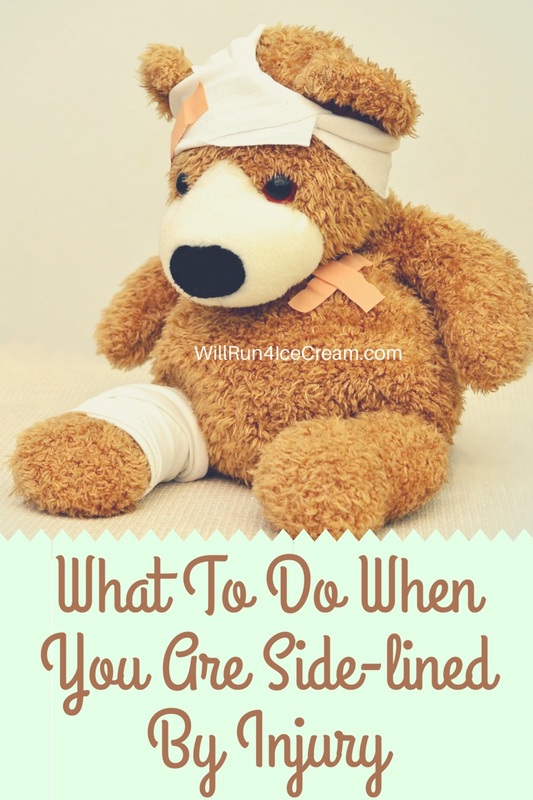 So now that I find myself on the injured list, what am I going to do about it? Well first of all, I'm going to listen to my body and to the medical professionals. You know your body more than anyone else. Yes, physical therapy can be uncomfortable, and it can cause pain. But if something feels off or just not right, please speak up. The therapists can't read your mind, and you can't read theirs. Communication is the key. Ask questions. Get answers. Be informed. Don't make assumptions - ask. Thankfully with this injury, I can still work my upper body and my core. Through that, I am learning to enjoy and cherish other ways to move my body. There have been times that I was unable to exercise at all. If you find yourself in that situation, I encourage you to find the enjoyment of rest. I know I know I know. No, seriously, I know. I have a very hard time sitting still. But rest is part of healing. And truthfully rest will make you stronger. So my advice is to try to cherish each stage. Because I have found with injury there are stages, and for me there are often setbacks. Learn from each one. Learn how your body responds to each and every phase that you put it through. And step outside your comfort zone - try new things. Sure, you may only do the new activity while you are injured and unable to do the activities you love. But then again, you may also find a new activity that you enjoy. It's not easy when your friends continue to improve and enjoy your sport while you are side-lined. But you too can come back stronger, and not just physically but mentally. One good way to stay connected to the running community is to volunteer. Most races are always looking for volunteers to help. A mistake that I made in the past was isolating myself from my runing friends. I was jealous. I was angry that I was home, and they were out running. I realize now that was a mistake, and one that I don't plan to repeat. But whatever you decide to do while you are on the side-line, I encourage you to make it a worth-while learning experience. Use this time to grow (and no I don't mean pack on 30lbs cause you aren't working out). But seriously, if you are injured, you are injured. Don't let it destroy you. Let it make you a stronger version of you!